We all know very well that the well-known Chinese smartphone manufacturer, of course, I am talking about Huawei which is one of the great companies in the world of technology. 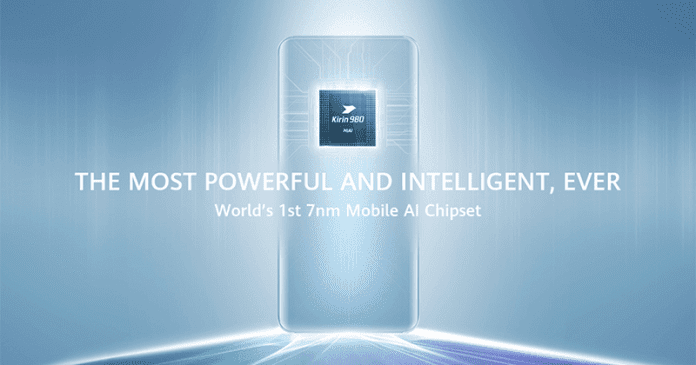 However, now according to the latest reports, the well-known Chinese smartphone manufacturer, of course, Huawei just unveiled its new flagship Kirin 980 SoC which is the world’s first 5G-ready 7nm mobile chipset and not only that even Huawei also claimed that the Kirin 980 is faster than the tech giant Apple’s A12 Bionic. The well-known Chinese smartphone manufacturer, of course, I am talking about Huawei which is one of the great companies in the world of technology that is present in another edition of the IFA running in these days in Berlin. As recently, we know that the brand has prepared its new flagship processor dedicated to smartphones. From the showcase, in addition to the Kirin 980 SoC, we were able to see other gadgets, such as a smart speaker, the Huawei AI Cube, and a Huawei Locator. It will be now that we will know all its details, but, surprisingly the most unusual thing happened is that there is no any smartphone presented by the well-known Chinese smartphone manufacturer, of course, Huawei. During this period of the year, we always had the opportunity to ramble around one of the biggest technology fairs in the world. And in this big event, the well-known Chinese smartphone manufacturer, of course, Huawei’s stand was one of the remarkable. A new SoC, a gadget to help locate people and objects and another that brings to our home the Artificial Intelligence, will be the big stars of this year’s event. After introducing its Kirin 980, Huawei saw the tech giant Apple raise the bar with the A12 Bionic which is present on its new iPhones. However, according to the Chinese brand, its new processor may even surpass the tech giant Apple’s powerful SoC. With the recent introduction of the new iPhones, the tech giant Apple introduced the new Bionic A12 processor, built in 7nm, which stood out for its performance and that surpassed all competition. Although the tech giant Apple dominates this market, the truth is that the well-known Chinese smartphone manufacturer, of course, Huawei will be able to meddle in the fight and win the first place. At least that is the claim of the Chinese brand, which announced at an event in Dubai that its new processor, the Kirin 980, could be better than Apple’s SoC. Presented in September, we can only see the true performance of the new Kirin 980 as soon as the new Huawei Mate 20 Pro is introduced on October 16th. Until then, only official brand data has been known, which has been preparing this processor for the past three years. Focusing on three specific areas (power and efficiency, intelligence and connectivity), we can find in this processor 6900 million transistors, the same number as the tech giant Apple’s A12 Bionic, as well as two NPUs capable of recognizing 4500 images per minute. According to the brand, this will be a major evolution compared to its previous processor, representing a 75% growth in CPU speed and 46% in GPU speed. After the tech giant Apple introduced the Aion Bionic A12, Huawei will try to surprise the Kirin 980, which is expected to greatly outperform the existing processors in the Android smartphone market.